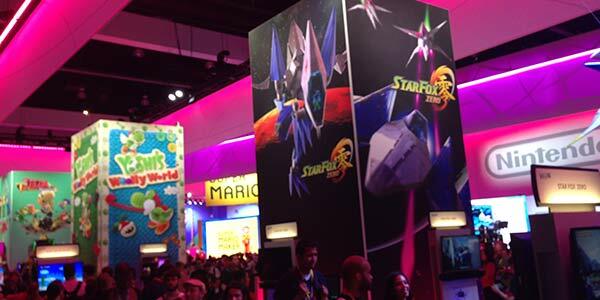 Below are some of my experiences and hands on impression at the Nintendo booth this year at the E3 2015. 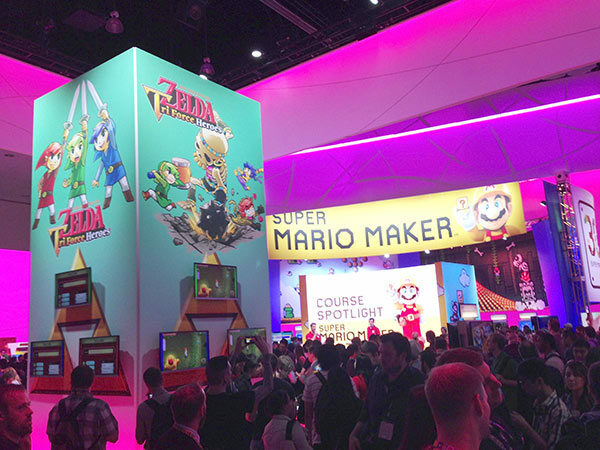 I was able to experience quite a bit, besides the horror of long lines and people puking with excitement (yes, you heard that right, it was gross, some girl did that at the Nintendo booth), it was quite a great time with some awesome games to be played. 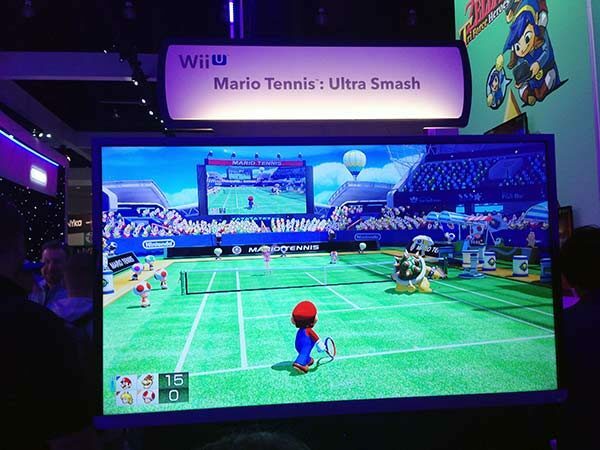 When I first heard and saw that Mario Tennis: Ultra Smash was going to be at this years 2015 E3, I was excited. I saw all the games lined up at the booth and Mario Tennis: Ultra Smash was first up on my play list. At the booth you got paired up with someone to either play with in a doubles match or play against. Due to my competitive nature I opted for the play against option. I was Mario and my opponent wound up choosing Bowser, which I guess is a great pairing as they are natural rivals. The first thing I noticed was that, hell this game was a lot of fun. The controls were very easy to grasp, I was doing a lot of jump shots and if my memory serves me right that was B. You can easily turn left to right to get those shots and hit the the left bumper to dive. One of the coolest features I saw was the ability to use power-ups on the court. You can only access them once you serve. I loved the fact that I could grow in size with a mushroom and then slam the ball on my opponent. The same rules for tennis apply to this title. It’s very colorful, fun and the fact that its multiplayer will keep you busy and lends itself to high replay value. I naturally won the whole match but I was put to the test for sure. Next on my list was to test out Yoshi’s Wooly World. This title had a couple options to start off the demo with. You can play classic mode where you play on normal difficulty (which is hard) or mellow mode which is for casual gamers to have fun and experience the story. Of course, I chose normal because I’m masochistic or something. The person I was paired with also was cool with this choice or at least didn’t complain when I was like “(pushed button) we’re doing this mode” and just selected it a second after we were prompted. I’m glad the dude next to me was good too, because it made my experience and his much smoother. We actually completed the demo all the way and helped each other out along the way and both got all the fun yarn bonuses. Plus we got a cool stitched patch for completing the demo. The girl/guy combo before us failed miserably. 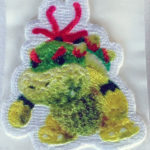 The girl wound up getting pissed, eating the dude’s Yoshi and would spit him off the cliff every chance she got. She was evil, as are most girls (cough), I digress. My experience was colorful and fun, the controls hold up well and works as one would expect. Do not however expect some Luigi hang-time on jumps though on normal mode. You will fall and you will die. In mellow mode its all out hang-time and you get wings and everything to float through levels. Overall this game is a must buy on my list, the fact that its another co-op game doesn’t hurt. 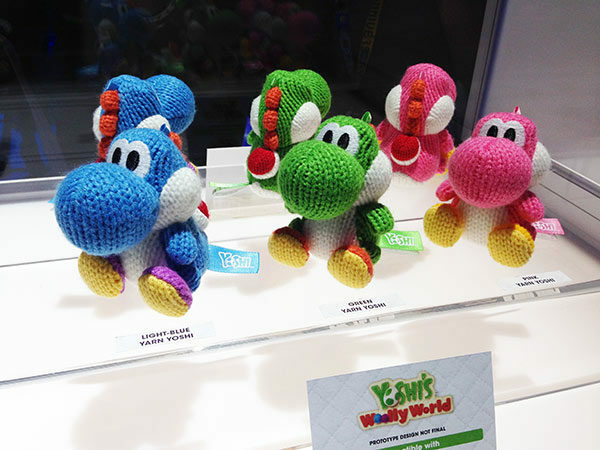 I also took the initive to take a photo of the cute Yoshi Wooly World Amiibo’s above. How can you not want one? I’m going to buy at least a Blue/Green one, who am I kidding I’ll wind up getting all three. 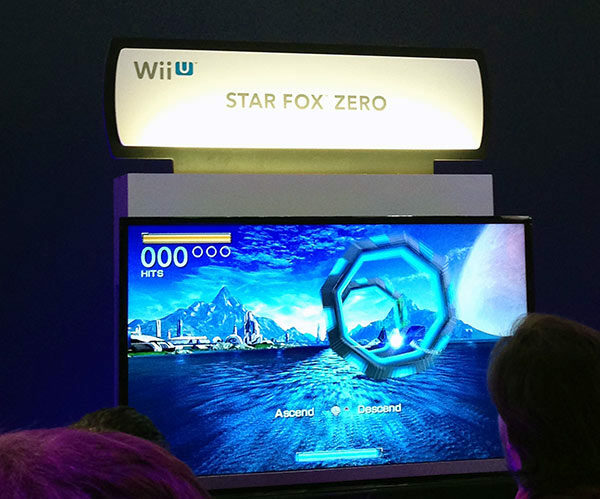 Next on the list was to get my flight badge and engage in Star Fox Zero on the Wii U. This game took me off guard at first. While I played previous versions of Star Fox, the controls were unique and took a while to adjust to. You use your Wii U gamepad to aim and target and your left analogue stick to fly the plane. This adds for a wonky experience. You can definitely disable the gyroscopic controls, but why would you? 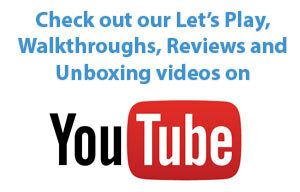 The Wii U is meant to be used this way, so lets get it right. Eventually I wound up gaining control and adapted to the feel. It was hilarious to see an hour of gamers ahead of me struggle. I was thinking it was worse than it was but realized if they weren’t as a heavy gamers as myself maybe this game isn’t for first time Star Fox fans who aren’t avid gamers. Maybe grandma or your jock brother need to sit this game out. Nintendo anticipated the out of control calibration so they built in an auto calibrate when you push down the left stick. I used that sucker more than I could count and it helped make my experience better. Overall, this holds true to the original Star Fox routine. Each mission is broken down in 3 phases and then followed by a boss battle. I successfully completed the demo and was glad it was still in development and hoping there are improvements before launch. Once they tweak it, I feel like this is going to be a very fun and strong title. The Star Fox world is fun to me and reminds me of the good ole days. 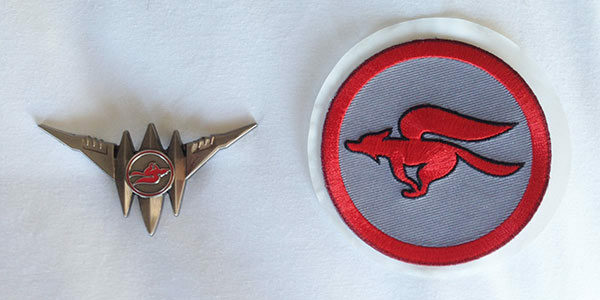 Once you master the demo you get rewarded with a flight patch. If you beat it, you get your wings, see below. On to the next event which I had little to no knowledge about prior to E3, Zelda Tri Force Heroes. This is a 3DS game that isn’t your average Zelda game. Zelda Tri Force Heroes is very dependent on your friends. There are three of you and you Link up together (no pun intended) to solve puzzles and fight battles. Now, if you have a slew of friends locally and family that all have 3DS systems and this game you’re ready to go. If not, then I’m not sure what Nintendo has planned for this game yet and they wouldn’t reveal any extra details to press about it whether online co-op is supported. One thing I noticed is you need verbal communication for this game. I was standing with two other guys who we’re all solving a piece of the puzzle at different times, it was much easier for me to say, you drop a bomb over there, then come over and everyone pick me up so we can totem stack and I’ll shoot the arrow through the fire so we can unlock this door. We fumbled for a bit and then once the verbal communication happened the game started to become extremely fun. There’s something about team work and taking on a level thats gratifying. So how it works is you have different suites that house different specialities, there is a bomb suit (catered to bombs), Zelda dress (gives your team more hearts), classic outfit, and kokiri outfit (specializes in forests levels), etc. There are quite a few that are unique that can help on certain stages depending on the surroundings of that level. The different weapons you can have is your sword by default everyone gets one, and then the players have to choose only one weapon and there are no duplicates, they are all needed in different ways to solve puzzles, the bow/arrow, boomer rang, dust, which shoots out of a bag to make things explode. Once we solved our way through three levels we encountered a fun boss fight, we were in the dungeon. The boss was an eye housed in a huge two stacked circle metal cage with spikes sticking out of it. You have to drop bombs in on the top, to make the eye come out and then either hop on top and slash it or shoot it with your bow. This takes team effort as you need to stack on each other to drop bombs and shoot the eye. The boss is all over too so you don’t get hit because guess what, you all share hearts collectively. Overall, this game was immensely fun, I’m just curious how its going to work out for people like me who have close friends who game in other states. Will there be online? My fingers are crossed and I’m hoping there will be. 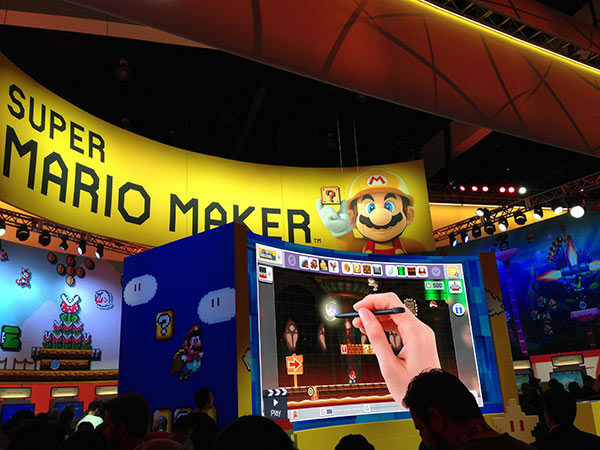 The largest event in the Nintendo booth was Super Mario Maker. They did some impressive demonstrations here and I was able to get my hands on it. First of all the game was easy to use, there were less level items due to it being just a demo but they assured me there will be a ton of things to build with. The way things interact are seamless. For instance, you want a flying gumba on your stage? Drag the gumba on the stage, drag the wings on it and boom. You can do that and mix and match a lot of combinations together. What I was most impressed with is being able to play it right away. As soon as you start building out your level you can hit play and test it out within a mili-second, no long load times. I was told that there will be fun challenges to be had and also there will be Amiibo interaction so you can play a level that you build with that said Amiibo. I find that to be amazing and quite fun, I’ve been waiting for something that makes the Amiibos more interactive. Also I was told by a Nintendo rep that Amiibos will unlock items you can use on your levels. Another cool facet is that you can change between mario games without having to start over. If you’re building a classic Mario world and you’re like wait, I want to play Mario 3, just click the main icon on the left, select Mario 3 and all assets adjust accordingly. Overall, this game is a must buy for any Nintendo fan there is a high amount of replay value. Don’t fret if you aren’t creative, because there will be a ton of levels available that Nintendo built and also levels that fans build that you can play, it’s like owning a whole new Mario game. Last but not least, they had a lot of Amiibos to check out. 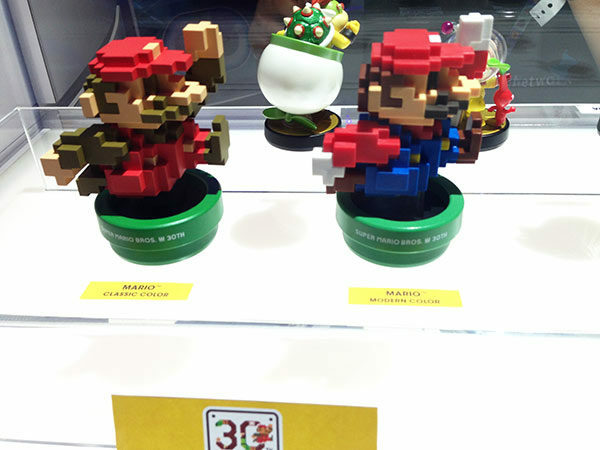 A lot of them you’ve seen but I wanted to make sure to capture the new Pixel Mario Amiibos above, enjoy.